Mochizuki-Kawai H., Kotani I., Mochizuki S., Yamakawa Y. (2018) Structured Floral Arrangement Program Benefits in Patients with Neurocognitive Disorder, Frontiers in Psychology, 9, 1328, doi: 10.3389/fpsyg.2018.01328. 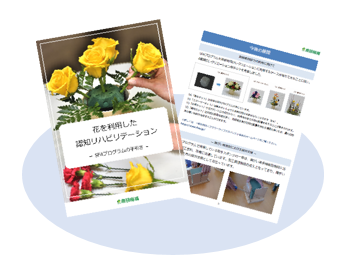 Mochizuki-Kawai H. Structured floral arrangement program developed for cognitive rehabilitation and mental health care. Japan Agricultural Research Quarterly. 50, 39-44, 2016. 望月寛子,小幡知史,山川百合子: 東日本大震災の被災地における花と緑を利用したケア, 均衡生活学, 10, 1-6, 2014. 望月寛子,小谷泉,牧山康志,山川百合子: フラワーアレンジメント作業を取り入れた認知リハビリテーションによって左半側空間無視症状を長期的に改善させた1例, 高次脳機能障害, 33, 262-269, 2013. Mochizuki-Kawai H. et al. (2010) Structured floral arrangement programme for improving visuospatial working memory in schizophrenia. Neuropsychological rehabilitation, 20, 624-636.